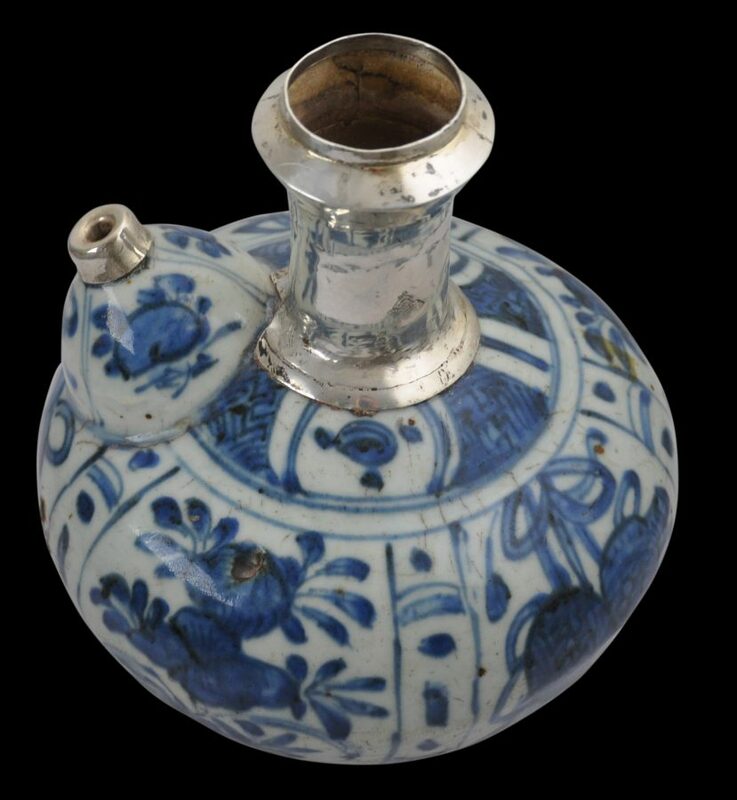 This porcelain drinking water vessel (kendi) was made in China for the Islamic export market. This example appears to have been destined for the Ottoman Turkey market, where high-grade, almost pure, silver mounts were added. 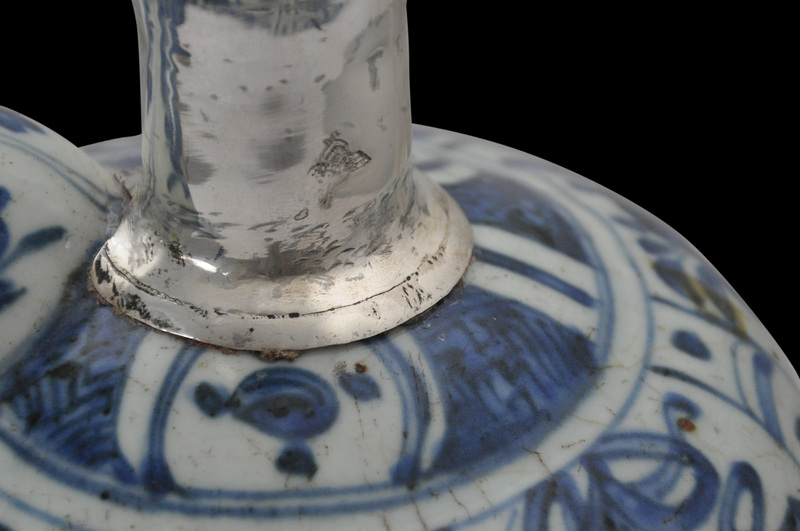 The mount on the neck has been stamped with a tugra, the emblem of the Ottoman sultan which was used as a silver assay mark. The kendi itself dates to the Ming Dynasty (around the 16th century), and probably to the Wanli period (1573-1619). Two similar porcelain kendis (without silver mounts) are illustrated in Khoo (1991, p. 84). It is likely that the silver mounts date to a period not long after. 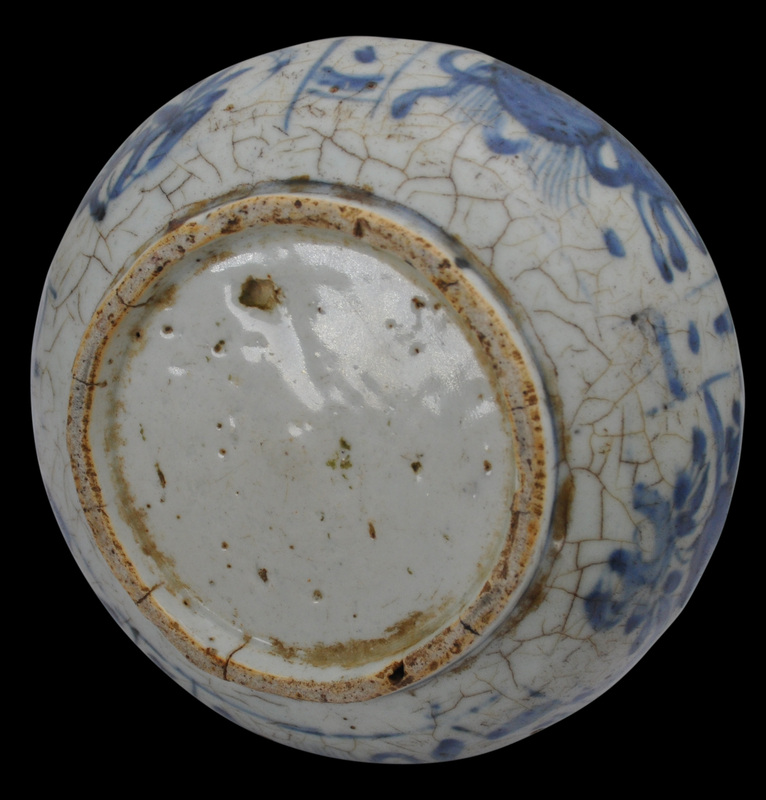 It comprises a globular body decorated in underglaze blue and cream with floral and gourd designs. There is a low bulbous spout with a small aperture capped with plain silver sheet. And there is a tall neck capped entirely in silver. The kendi sits on a low ring foot. 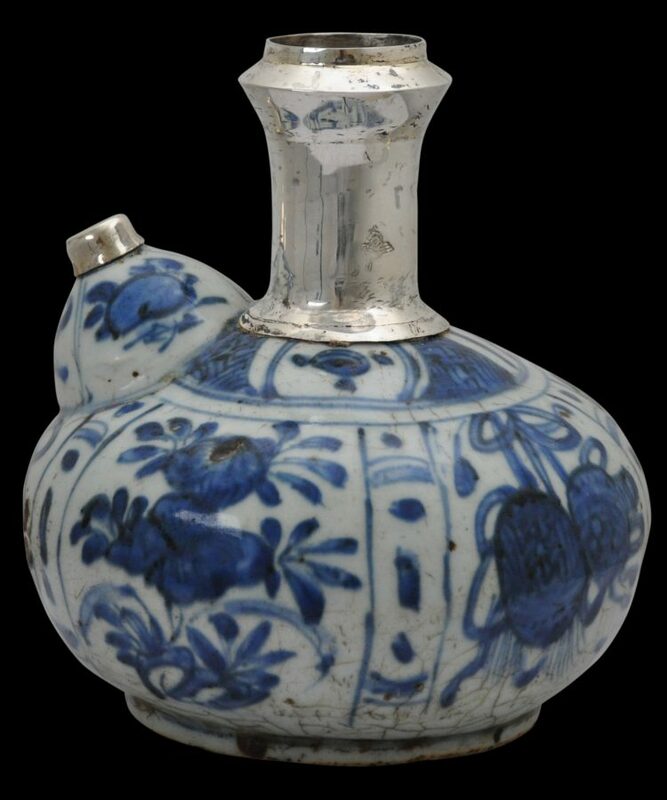 Kendis such as this example with a bulbous spout were not used in China; they were made entirely for export, mostly to Southeast Asia. 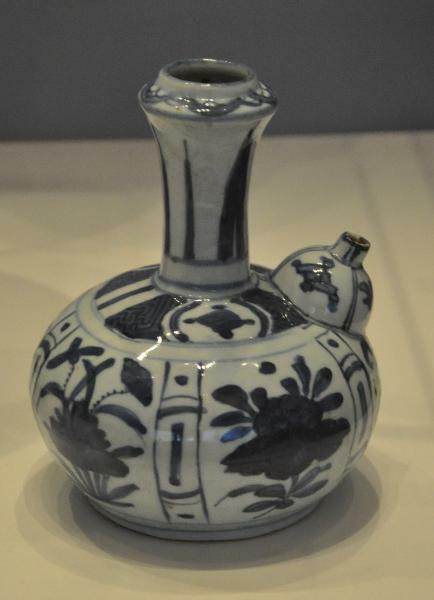 It is believed that the form originated in Southeast Asia but by the Ming Dynasty, the shape had been copied by artisans in China for export (Eng-Lee, 1984, p. 40). 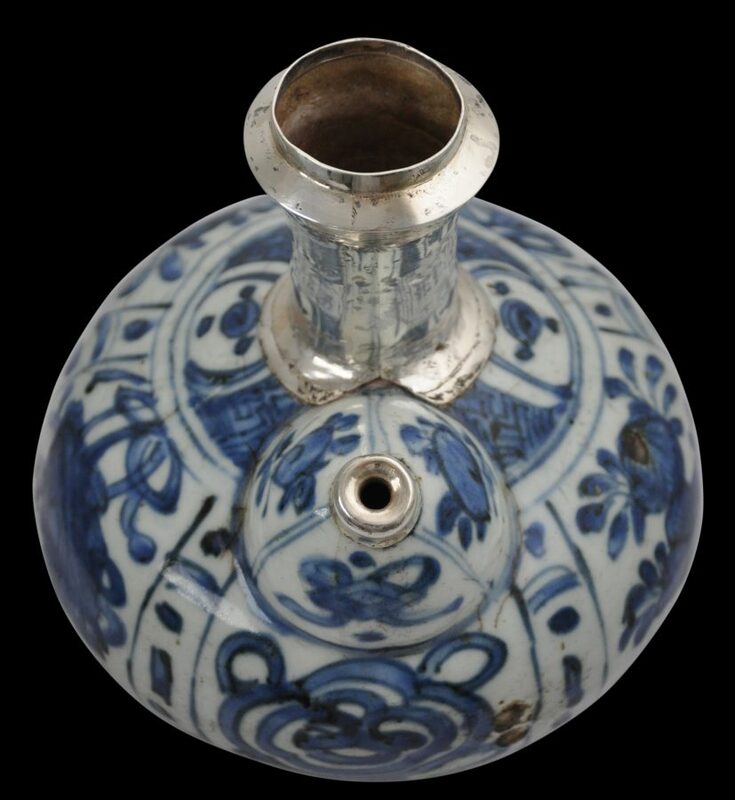 See Ucok (2001) for examples of kendis and other Chinese porcelain items that are now in Turkey and with Ottoman silver mounts. The kendi here is in fine condition. There are no cracks of repairs; simply wear commensurate with age. The tugra mark is clear in this image. Folsach, K., von, Art from the World of Islam: in the David Collection, 2001. Khoo, J.E., Kendi: Pouring Vessels in the University of Malaysia Collection, Oxford University Press, 1991. Ucok, A. (ed. 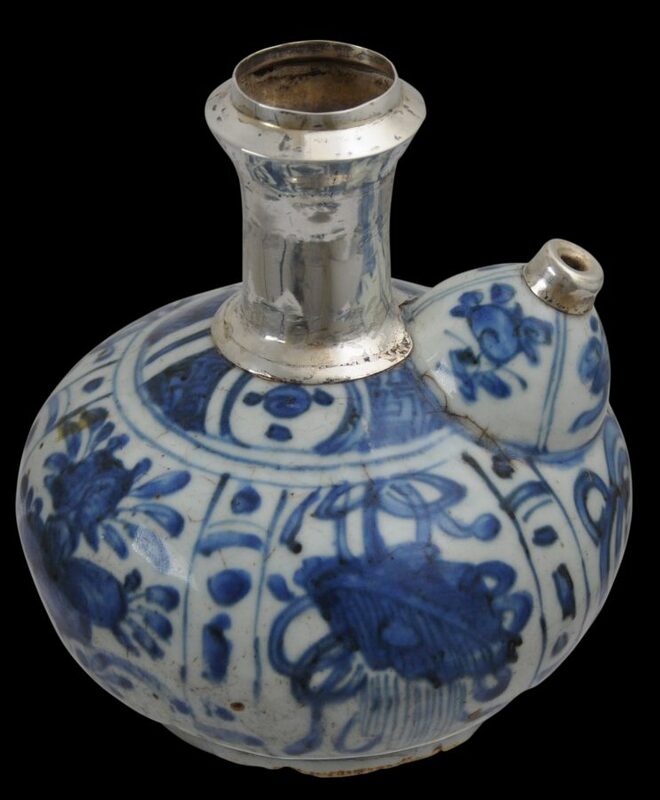 ), Chinese Treasures in Istanbul, Ministry of Foreign Affairs of the Republic of Turkey, 2001.